The Caldecott Honor Books are runners-up to the Caldecott Medal, is awarded for the previous year’s most distinguished American picture book for children. 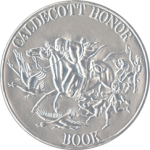 Learn more: official Caldecott Medal and Honor homepage. This is a compilation of longer traditional nonsense verse such as The Robber Kitten and Frog Went A-Courting. King Douda enlists the seven Simeons to help him find a bride. A little boy named Andy was interested in lions. On his way to school, he met a real lion with a thorn stuck in its paw. The classic tale of Snow White. This is the story of how Wee Gillis decides whether to live in the Scottish lowlands like his mother’s family or in the highlands like his father’s people. This is the second book by the author and illustrator of Ferdinand. The smallest of the twelve French orphans under the care of Madame Clavel wakes up one night with a tummy ache. Each letter has a large illustration and a patriotic essay. April’s cat Sheba has three kittens. But her father insists that theirs is strickly a one-cat household. April must give up three cats, but which ones? Explore the Great Lakes and the Saint Lawrence Seaway with Paddle. A first going to bed book. The Christmas Anna Angel makes Christmas cakes for Anna and her brother. The little black lamb wanders off from the flock, but the shepherd and his dog go back up the mountain to find him. We don’t love people because they are beautiful. They are beautiful because we love them. You don’t know what you might catch when you go fishing in McElligot’s pool. Eighteen of the original ballads of Robin Hood are illustrated here. Most of them also have accompanying music. The adventures of a little girl and a baby bear while hunting for blueberries with their mothers one bright summer day. King Derwin of Didd summons his royal magicians to create something new and exciting to fall from the sky. He gets a royal mess. A first going to bed book. This second edition was in a larger format. Gerald McGrew designs a new zoo. A child’s-eye view of things that fall down - or don’t.